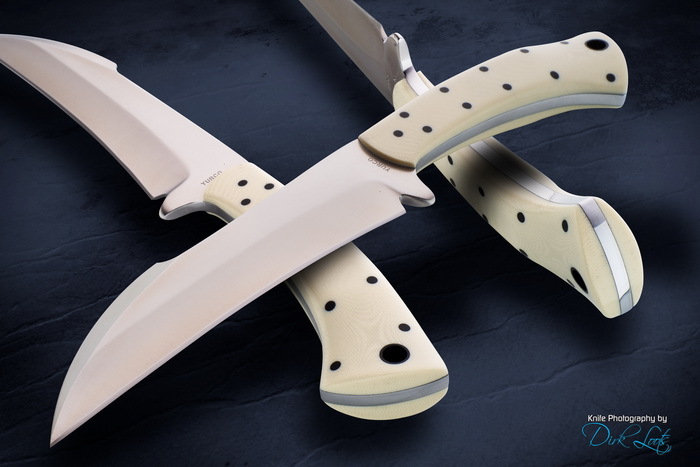 **** Chosen by Winner: Jim S.
Mickey Yurco has crafted an exciting Mini-Ginunting fixed blade based on the Philippine Marines sword of the same name. This full-tang knife has a 7.25-inch hollow ground blade satin finished blade of 440C Stainless Steel with Ivory G-10 handles and carbon fiber pins and lanyard hole. It is 12 inches overall. A maker-made stippled 9 oz. leather sheath is included. I have been making knives since 1983. My knife mentor is RW Wilson from Weirton, West Virginia. Although I make hunting and backpacking blades, I focus more on tactical fixed blades. Most of my customers are law enforcement, military or martial artists. I have studied martial arts since 1973 and I have ranking in several different combatives systems. In 1978 I started a career in Police work. I retired in 2011 at the rank of Sergeant from the Mahoning County Sheriff’s Department in Youngstown Ohio. Most of my duties was in the Patrol division. I was also involved in SWAT operations for 16 years. I was assigned to form a tactical team for our deptartment in 1995. That evolved into an assignment with the FBI based Mahoning Valley Violent Crimes Task Force. My duties on this team ranged from operator to team leader to trainer. We were an active team consisting of 30 police officers from multiple jurisdictions. Through the years, I also worked undercover, investigations and corrections. Since my retirement I am active as an instructor in the Police Academies at Kent State University and Youngstown State University. My areas of instruction are Use of Force, Defensive Tactics, Firearms, Chemical Agents and Patrol Tactics.